Market Pulse 2019: Are You Ready For The Next Rally? By Tyler|trading education articles|Be the first to comment! Is It Time To Buy Stocks? Until there is a clear buy signal in place we will not know if the S&P 500 has put in an intermediate-term bottom. 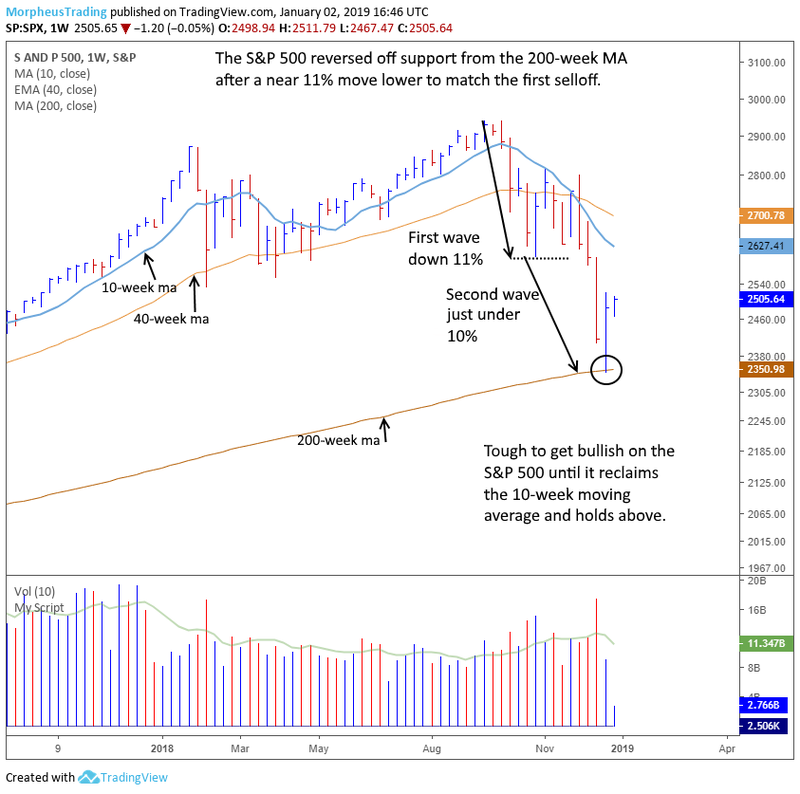 Last week’s reversal off support of the 200-week moving average suggests that the next few weeks will likely be a choppy mess, as stocks attempt to settle down after a few weeks of volatility. Market conditions are not yet ideal to produce a sustainable rally. A short term bounce from oversold levels yes, but in order for stocks to push significantly higher leadership must emerge while broad market averages cease making new lows. In order for a stock to enter into the discussion of becoming a leader, it must first form a valid basing pattern (for a quick review of what a valid basing pattern looks like click here). However, most stocks will trend lower with the market making it quite difficult to produce a bullish pattern. Those that do have the potential to become a market leader. 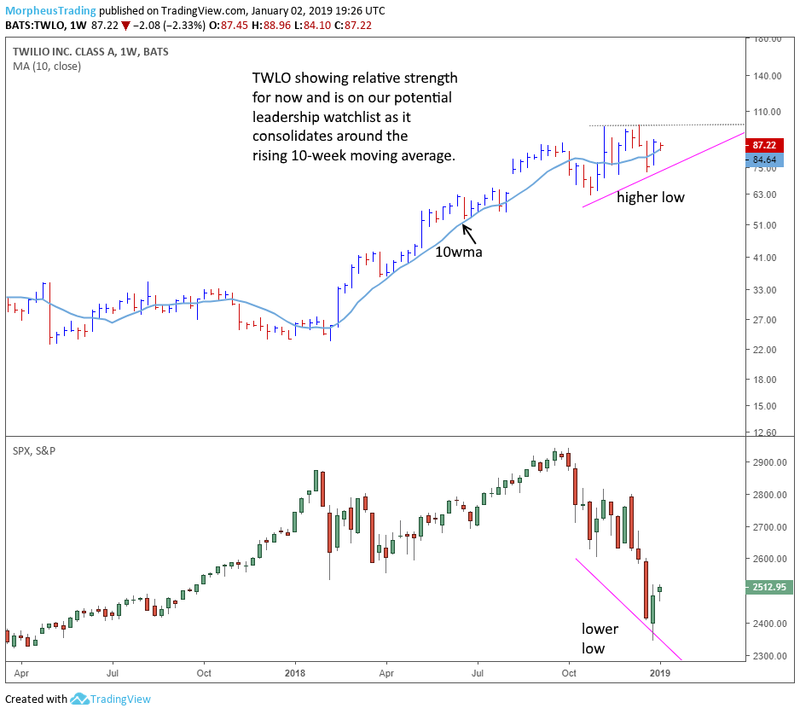 The weekly chart $TWLO below is an example of a stock that has held up really well during the current selloff and could become leadership down the road. As mentioned above, the market is not ready to launch into rally mode but that does not mean one should ignore the long side of the market as conditions can change quickly. For most investors, monitoring the market on a daily or weekly basis is difficult as life gets in the way. For those who want to stay in touch with the market (whether investor or active trader) our nightly newsletter The Wagner Daily is a must read. Along with a Sunday through Thursday night report written in a no-nonsense and to-the-point manner, subscribers have access to our proprietary timing model and relative strength watchlist, which is where we monitor stocks like $TWLO above. Are you ready to get started? Sign up for The Wagner Daily newsletter today! Top 20 Most Popular Posts - Read More! What Is Swing Trading? Is It The Best Trading Strategy? How Much Volume Is Enough For Trading Stocks & ETFs? Reproduction without written permission is strictly forbidden.